Adolph Gysbert Malan, better known as Sailor Malan, was a famed World War II RAF fighter pilot who led No.74 Squadron RAF during the height of the Battle of Britain. Under his leadership the 74 became one of the RAF’s best units and Malan’s exploits during the battle left a lasting legacy. According to director Guy Hamilton, the character of Squadron Leader Skipper in the 1969 war film Battle of Britain was explicitly based on Malan. But what made him such a well respected pilot, and how did No. 74 squadron become a Battle of Britain success story? 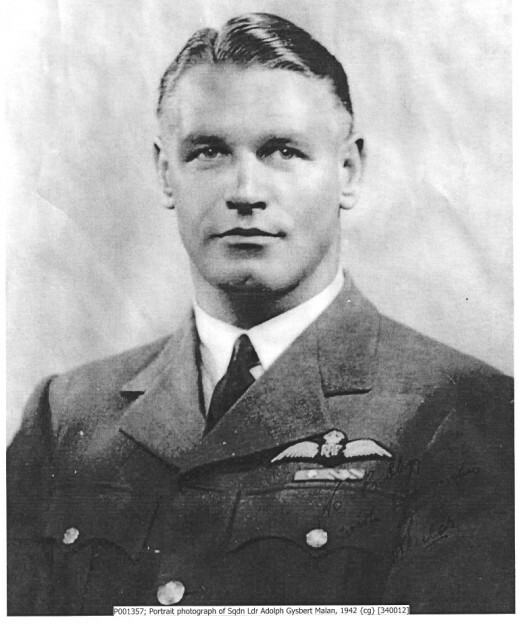 South African-born Malan joined the RAF in 1935 after a stint in the Navy. He soon went on to join 74 Squadron in 1936. Malan was given command of the squadron at the height of the Battle of Britain; on 11 August 1940 74 was sent to intercept a raid near Dover, which was followed by another three raids. At the end of the raids, 74 claimed to have shot down 38 aircraft, and the day was known from then on as ‘Sailor’s August the Eleventh’. Malan himself commented, ‘thus ended a very successful morning of combat’. This was the first of Sailor Malan’s victories. However, by the end of 1940 he had achieved 18 victories and received the Distinguished Service Order. Malan is not thought to have been a particularly skillful or gifted pilot. Having said this, he did possess many other talents that led to success when commanding 74 squadron. Malan’s particular strengths were his superior use of tactics, an exceptional shot and an aggressive fighting style, as demonstrated during the Battle. It seems that use of these skills and the subsequent passing on of his knowledge were a recipe for victory. During the Battle of Britain, 74 squadron abandoned some of the RAF’s outmoded doctrines under Sailor Malan’s leadership. For example, they ended the practice of flying in a Vic formation of three aircraft in favour of the German Schwarm or Finger Four formation with a Tail-end Charlie to cover the flight. This formation was later generally used by Fighter Command. In addition to this, Malan had great success with what he referred to as his ‘ten simple rules’ for fighter pilots. These rules proved indispensible to future generations of fighter pilots and could eventually be found on the walls of most airbases. During his illustrious career Adolph Gysbert Malan won not only the Distinguished Service Order and Bar but also the Distinguished Flying Cross, Belgium Croix, Czecho-Slovakian Military Cross, French Legion Of Honour and French Croix de Guerre. Malan was a strict disciplinarian, and honed 74 Squadron into a superb air fighting unit during his tenure as its commander. The lasting respect Adolph Gysbert Malan commands, as well as the continued use of both his new formation of flying and his ten rules for fighting, stand testament to his achievements as a Battle of Britain pilot.